The situation in Venezuela has become so desperate that people are using any means to get food, but nobody thought it would get this bad. 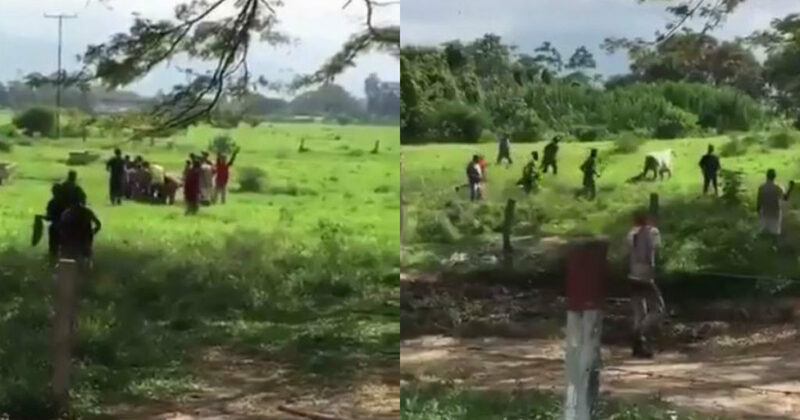 A video shared on social media shows a group of people throwing stones at a cow so they can kill it for food. The video went viral online and showed the tragic reality the South American country is currently facing. Food is not the only problem in the country. Lack of medicine and other medical supplies is one big problem Venezuelans have been facing. Opposition Venezuelan Deputy, Carlos Paparoni, posted the video in efforts to regularize food standards in the country and help the crisis end. It is not the first time that Paparoni shares those kinds of images. Before releasing the video, he shared photos of Venezuelans looking for food in the trash on the streets, depicting the horrendous situation the country faces. The province of Merida is one of the most affected communities, as shown in the viral video, people need to take unbelievable measures to survive. Venezuela is considered one of the poorest countries in the world and is the poorest of Latin America. The minimum wage per month is about $8.00, and the incredible inflation figures exceed 2000%, making life unsustainable. Even the money that their relatives send them has little to no use, as the shortage of food and medicine makes it difficult to find anything.